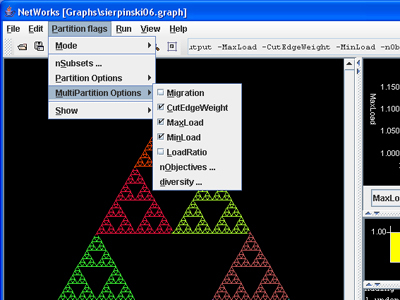 The graphical user interface to the mathematical optimisation software has been designed to be as intuitive as possible. The network planner has easy access to the important optimisation parameters without being mired down by a range of unnecessary settings. However, if additional functionality is required, access to advanced options (that already exist in the code) can easily be built into a bespoke system. The optimisation process is fully animated, with as much detail as is required, to help the network planner learn and understand the software abilities. Watch detailed views of the multilevel coarsening, refinement and expansion algorithms in progress. Or just generate 500 high quality solutions (and have the software select the best ten or so) at the touch of a single button. 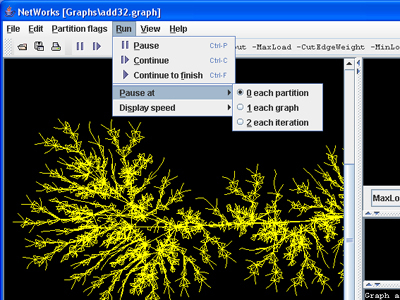 Both example graphs shown on this page are extracted from different applications (self-similar structures and circuit partitioning) and are not meant to represent real mobile phone networks.